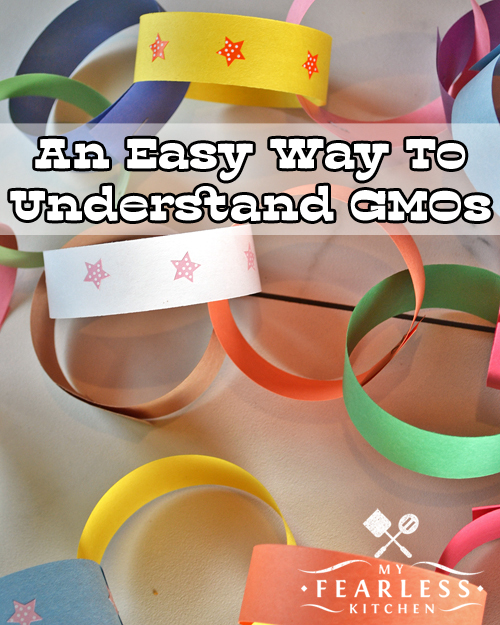 If you just want a short, simple explanation about what a GMO is, this post is for you. 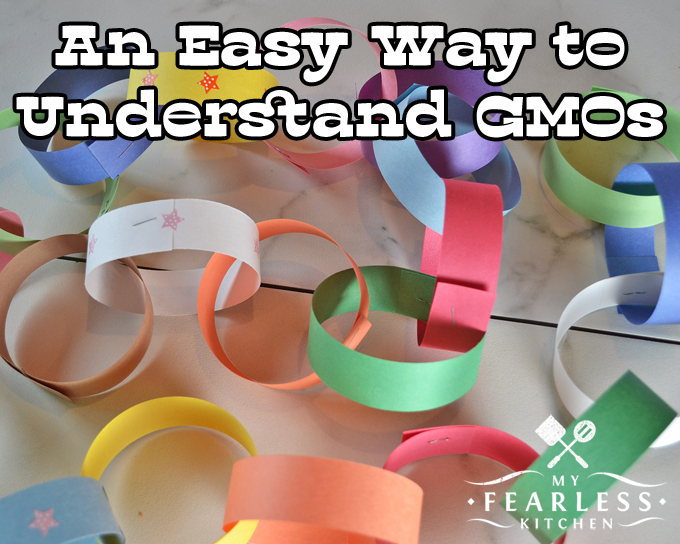 See how DNA is like a paper chain and how a GMO is made. 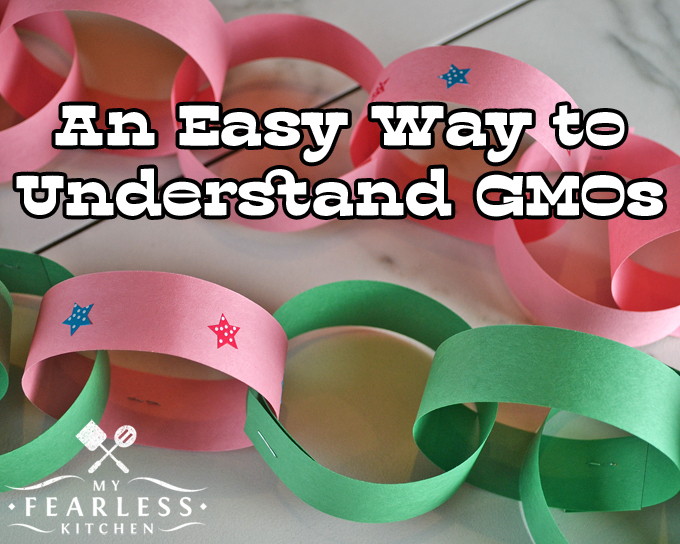 Please Make It Simple – What Is A GMO? Genetically Modified Organisms. GMOs. They are a hot topic. And a confusing one. So I’m going to try to break it down for you as simply as I can. The first thing to know is that in a GMO, the DNA is changed – just a little bit. All living things have DNA. Everything – bacteria, bugs, plants, animals, and people – it all has DNA. DNA is a long chain of genes. Every living organism has different DNA. Some parts of your DNA are the same as every other person’s DNA – that’s what makes you a person. But you also have some parts of your DNA that no one else has – that is what makes you YOU. Genes are also long chains. The links in a gene chain are called bases. There are only 4 bases that make up every single gene. The way they get put together (how many, and in what order) is what makes every gene different from every other gene. The way the genes get put together (how many, and in what order) in the DNA chain makes every organism different from every other organism. Get some more details on DNA and genes in this post. So let’s take these paper chains as examples of DNA. These chains represent DNA from two different organisms. One is green, and one is pink. Each link in the chain is one gene. You can see that one link (gene) in the pink chain (DNA) is special – it’s got stars! What makes that link/gene special? It could be a lot of different things. Maybe this special gene means that the pink guy tastes bad so predators don’t want to eat it. Maybe this special gene means that the pink guy can survive with less water. Maybe this special gene means that the pink guy won’t be killed by some pesticides. This special gene could be the reason the pink plant grows taller and straighter; it could be the reason a bug grows faster or has shorter legs; it could be the reason a cat has black fur. Once scientists figure out what that special gene does, they decide if this special gene would help a different guy (in this case, the green guy). If it’s a helpful special gene, scientists will make lots of copies of the special gene. After scientists decide that the green guy will be helped by the pink guy’s special gene, they add one copy of the pink guy’s special gene to the green guy’s DNA. The special gene only gets added to other DNA one time. It only goes in one place. It goes between other genes, and does not break any existing genes. It doesn’t mean that the green guy is now pink. It only means that now the green guy has one special gene from the pink guy. The green guy has no idea that the pink gene wasn’t his from the beginning. The pink guy still has that gene, too. And now the green guy can do that special thing that only the pink guy could do before. I know you have more questions. Check out the links below, and be sure to leave me a comment with your questions. If they have a “simple” answer, I’ll answer in the comments below. If it’s more complicated, it will probably become a new blog post! How is a GMO Made? Why Don’t Farmers Save Seeds?